Now I don’t want to do another piece on the evidence that learning styles do NOT exist but I do want to expose the reasons for their widespread belief. Surveys consistently show that the vast majority of teachers, trainers and lecturers believe in learning styles. Despite decades of research showing that the theories are bogus, the belief persists. It is so ubiquitous that it’s hard to attend an educational conference without hearing the phrase being repeatedly parroted. Seasoned campaigners shake their heads in disbelief every time they hear the term but it is so deep-rooted it seems to be impossible to shift. This is a real conundrum. One could argue that these professions are in a pre-Copernican state, believing that the sun moves around the earth. Their only appeal is the same as the pre-Copernicans - look the sun moves across the sky, it feels right to me. Another analogy would be flat-earthers – everywhere they look they see that the land is flat, so the entire planet must be flat. There is always a villain and in this case it is intuition. In both cases ‘intuition’ trumps reality, where limited personal intuition fools the mind. Puzzlingly, even when the evidence is presented, that the truth is the opposite of what one thinks, it is ignored. I get this. It feels as though learners are different. They are. But the non sequitur is to think that they should learn differently. The differences are in ‘personality’, which are real. These are then translated into the fiction of learning styles. It is a category mistake. There are many complex issues at play here but the simple fact that people differ in terms of well–researched personality traits, is mistaken for ‘learning styles’. There is one complication here, in that some learners have conditions that can inhibit and distort learning; learning difficulties, disabilities, dyslexia, autism and so on. But these should not be confused with generalised learning styles. Learning styles is a set of theories. Coffield found 71 of them, surely a sign that something is amiss? But the appeal of some of the more common theories seems to come down to two things. First, they are represented as researched, evidenced and science, when they are not. Second, they are simple models, such as VAK or Honey and Mumford’s 4 categories, which are simplistic, easy to learn, easy to put on a training PoewerPoint slide and all too easy to explain. The danger here is that their categories are treated as fixed entities with no statistical distribution or overlap. The data gathering to decide what style a person has is also woeful. This promotes a lack of critical thinking. Other forces are also at work here. Teaching, as practised by teachers, trainers and lecturers, is not, like ‘medicine’ or ‘engineering’ - evidence or even research-based. In fact, the research is treated with great suspicion. Many who teach, especially in higher education, in research institutions where they should know better, have no real knowledge of what good teaching entails or how people learn. The defence you often hear is that teaching is a ‘practice’ and not the application of theory, evidence-based or otherwise. The problem with this defence, is that it simple begs the question ‘What practice?’ We still need some way to distinguish good from bad practice. This anti-intellectualism allows those who teach to literally do what they want even down to believing and applying false and damaging theories. Professional bodies are also to blame, having blindly regurgitated old theory in courses (which they sell), for decades. One really does have to ask what teacher training has been up to for all these years, when their student-teachers come out as flat-earthers? Why don’t they come out and say what needs to be said? For many years professional bodies, such as the CIPD and ASTD, who survive on running courses, promoted these practices. In practice, they tended to reinforce these faddish theories, as they made money from them, and it was left to researchers and bloggers to do the hard work. To be fair some have moved on, especially the CIPD. Few read much in the field and CPD is scarce and often faddish. Courses often contain the standard memes such as Maslow and Learning Styles, as there is no real intellectual rigour in their design. Those that pass for experts have actually cobbled together their courses from previous courses. Paschler is right in identifying a vast industry of conferences, workshops, courses, books and CPD around learning styles, that perpetuate the myths. Lastly, we have groupthink. People hear the terms so often that they believe them to be true. They become memes in a community, uncritically used and deeply embedded in a culture, a culture prone to taking things at face value. Questioning these sacred cows becomes an act of betrayal. Teachers feel good in themselves because they feel as though they are treating learners as unique individuals, when what they are actually doing is the very opposite – stereotyping and destroying learning. Finally, and this is the killer argument for me, even if learning styles were true, stereotyping learners is dangerous, if not counterproductive. Let’s suppose I do have a disposition towards not ‘reading’. This could be because I come from a background (like me) where there is no culture of reading, a household that has no books. This disposition should not be used to focus on visual, auditory or kinaesthetic learning. What a good teacher should do is teach that child to read, perhaps put even more effort into that practice. The learners that lose out here are the poor and disadvantaged who are stereotyped into low achieving channels. It is easy to feel as though learners are different (they are) but to categorise them as VAK, or some equally as vakous schema, is a big mistake. At the University of Illinois, they found that students who had been fed the myth of Learning Styles at school, were held back by this at University. It was regularly quoted by students as a reason for their poor grades, used as an excuse for failure. For me, this is a touchstone issue. The fact that it has persisted for so long is a damning indictment on our professions, practices and professional bodies. 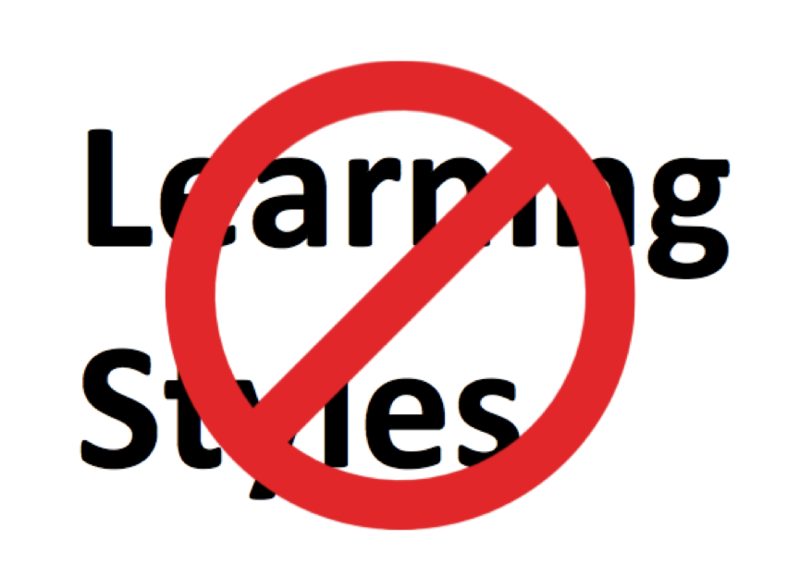 Learning styles do not exist - let me repeat – learning styles do not exist. To believe in learning styles is to believe that the sun goes round the earth or that the earth is flat. It’s an intuition gone bad – a fail. Worse still, is to apply this theory in practice. If you categorise children as VAK or adults to Honey and Mumford or any of the other dozens of learning styles theories, and yes there are dozens, you’re doing learners a disservice. You may even be ruining their education. We have 35 years of evidence against learning styles. This includes individual studies, systematic reviews and books. People like Pedro de Bruyckere, Wil Thalheimer and I have been talking about this for decades. Chapter 1 of Pedro de Bruyckere’s book ‘Urban Myths’ is an excellent summary of the research. A critique of Fleming’s VAK can be found here and a critique of Honey and Mumford’s theory can be found here. To get specific for a moment. Kratzig and Arbuthnott’s took learning styles as identified using self-report and a questionnaire. Less than 50% of the participants identified the same learning style using both assessments, raising serious questions about their validity. 40% of participants self-identified as visual learners, and 60% were identified as visual learners through the questionnaire, but only 23% performed best on the visual test. The percentages were 16% and 8% for kinesthetic, yet 52% performed best with the tactile test. This research show no significant correlation between learning style and objective memory performance. Coffield, F., Moseley, D., Hall, E., Ecclestone, K. (2004). Learning styles and pedagogy in post-16 learning. A systematic and critical review. London: Learning and Skills Research Centre. Clark R. E. (1982) Antagonism between achievement and enjoyment in ATI studies. Educational Psychologist, 17(2), 92-101. Rayner, Stephen G. (July 2013). "Problematising style differences theory and professional learning in educational psychology". The Australian Educational and Developmental Psychologist. 30 (Special Issue 1): 13–35. doi:10.1017/edp.2013.2. Ritter, Leonora (October 2007). "Unfulfilled promises: how inventories, instruments and institutions subvert discourses of diversity and promote commonality". Teaching in Higher Education. 12 (5-6): 569–579. Stahl, S. A. (2002). Different strokes for different folks? In L. Abbeduto (Ed. ), Taking sides: Clashing on controversial issues in educational psychology (pp. 98-107). Guilford, CT, USA: McGraw-Hill. Riener, Cedar; Willingham, Daniel T. (August 2010). "The myth of learning styles" (PDF). Change: The Magazine of Higher Learning. 42 (5): 32–35. Learning styles persist because for many (boring, new, accidental) trainers/teachers they open the door to consideration of how learners might engage with learning. The questions that learning styles sprung from (albeit a spring way too far) are good questions. I think that a useful discussion of learning styles would have to consider why we haven't come up with with an alternative, positively transformative option. I'd be interested to hear if you've seen one. The problem with the engagement argument is that it makes trainers/teachers engage in the worng way. To stereotype learners, is, as I argue, a destructive, not constructive act. On alternatives, we have in cognitive science, strongly evidences theories on how people learn and great candidates, that are largely ignored. Effortful learning, learn by doing, formative assessment, deliberate practice and spaced practice. Few teachers and trainers know even the rudiments of emmory theory. That's like bridge builders not knowing and physics. This is a great set of "whys" but please be careful yourself of the generalisations about what ITE are doing with "learning styles". I am not aware of any systematic research into what ITE institutions are teaching but as more and more training moves into schools (in England) there is more of a danger of this being passed on in the classrooms rather than the lecture halls. I know from my own practice that whilst we talk about learning we do not talk about learning styles in a simplistic way and certainly not in a simple categorisation way such as VAK. You quote Coffield above and as you say there are many, many ways of defining learning. I agree that moving training out to hopless INSET days will be a disaster. But I don't buy the idea that teacher training does not tot learning styles. there are umpteen links to Universities that promote Learning Stles as part of good practice in teaching. The real issue Paul is whether the courses deal with hte actual research. I feel they don't. new teachers come out believeing this stuff - it comes from somewhere. I remember giving a talk to a room packed with fresh young teachers at ResearchEd, who were genuinely shocked to hear about this research. They had no idea. I'm sure there are pools of good rpactice but generally? I'm not so sure. I suppose I base my evidence on the widespread and deep belief in their existence and efficacy among young teachers. learning styles till being actively taught to student teachers in some teacher training colleges. Met an NQT whose final year dissertation topic it was. This year. Hi Donald. Do you believe that it's possible to talk of "learning preferences" even if one does not try to teach to them? Whether evidenced or not this seems plausible at least.